Greek mythology makes fine inspiration for gloves. Here we have the REV'IT Centaur GTX Gloves and REV'IT Oceanus GTX Gloves. One is a creature with the head, arms, and torso of a human and the body and legs of a horse. One is a titan who personified what the Greeks believe to be a river that encircle the earth. But they’re also both waterproof winter gloves. Makes sense, right? Right. If Greek myth is to be believed, the REV'IT Centaur Gloves sit right below the Oceanus Gloves on the food chain. Still not a throwaway piece, by any means, the Centaur Gore-Tex comes complete with a goatskin palm and Temperfoam knuckles for protection, DexFill tri-fleece liner for warmth, and a 100% Gore-Tex membrane for waterproofness. There’s also a few bells and whistles that I can guarantee centaurs didn’t benefit from. 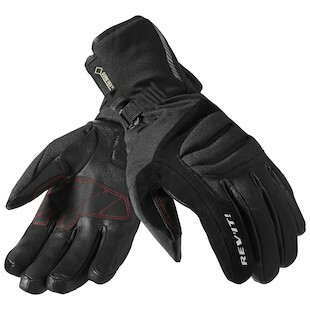 A visor wiper, extra grip patches on the palm, a bit of elasticity in the wrist makes for a comfy touring fit great for four-season riders and commuters. And speaking of commuting, a bit of reflective material on the fingers and cuff will help you be seen by those pesky people who insist on riding in vehicles equipped with four wheels instead of two. There’s also the REV'IT Centaur Women’s version as well with all the same safety features, but with a fit that accommodates centaur females. Or human females. Honestly, I’m not even sure at this point.